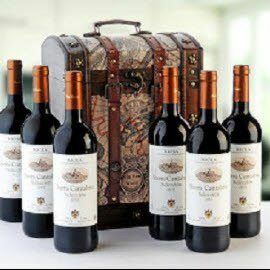 Quality Rioja Six Bottle Wine gift in a wooden map themed Chest. Tasting notes, 2014 Seleccion from Rioja, which is 100% Tempranillo aged in a combination of tank and American and French oak barrels. The wine is soft and easygoing, with attractive tapenade notes intermixed with graphite, black cherry and toasty fruit notes. CANTABRIA WINE. Founded in 1870 in the village of San Vicente de la Sonsierra located at the foot of the mountains that give the name to the cellar and also protects the vineyards from the cold winds of the north. This winery consistently makes the pages of THE WINE ADVOCATES best buy section regardless of vintage.